Image Size: 35 X 6 in. The first sight of buffalo ignites excitement with a party of scouts. The lives of these men and these animals are entwined together on the vast map of the Great Plains. The arrival of the buffalo will herald many celebrations. The Creator has bestowed an answer to the tribe's prayers with a gift of rain and endless herds. It seems that with every artist there are works that manage to make it into private collections before they are properly documented. Some of these can, in hindsight, be rather important ones. They are known to exist, but their whereabouts are a mystery. As is often the case, in time, they somehow, some way, someday reappear. 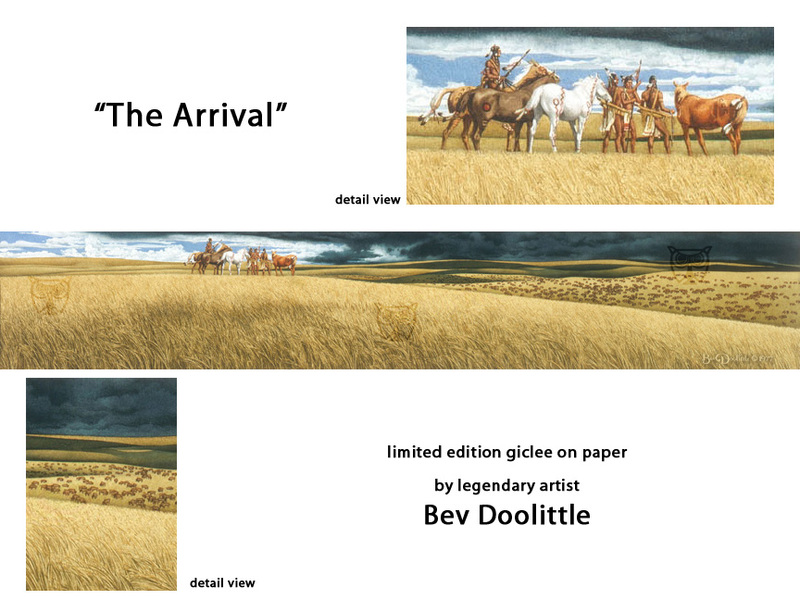 Bev painted The Arrival in 1977 and sold it through a gallery in Denver, Colorado. The work’s trail ended there. Long thought lost, the painting was recently rediscovered! In the thirty-year period since its rendering, Bev has produced fifty Fine Art Editions, as well as seven books and folios of collected works, all published by The Greenwich Workshop. Until now, The Arrival remained elusive. Available in print for the very first time, it is one of the earliest works featuring the rendering style for which Bev has become renowned. Storytelling is a hallmark of nearly all of her compositions and "The Arrival" is no exception. The palette and design are instantly recognizable. Both are in service of the eponymous “Doolittle narrative” which has shaped the artist’s reputation. There is no escaping the implication of a “storm on the horizon.” Those dark clouds immediately bring to mind the Native American experience in North America. This is storytelling through design at its finest. "The Arrival" will be reproduced with an eye towards tradition but with the most up-to-date technology. This Fine Art Giclée will be created on the highest quality Hahnemuhle German Etching fine art textured paper. Deckled edges allow for either a traditional or floating frame presentation.